Have your Child Create Something Amazing for Your Home, Office, as a Gift or Just for Fun! From this project, children will learn the dynamics of working as a team, emphasized through participation. They will gain feelings of respect for their achievements and will witness the strength of creative collaboration. It is amazing how creativity blossoms profusely with the tiniest bit of nurturing. Colorful Hands’ WORKSHOPS emphasize creativity, fun and teamwork — and they’re not just for kids! • Book a date, time, location, type of program and child needs. • An artist comes to your home with a complete set of supplies to work with your child or group in a fun artistic collaboration. 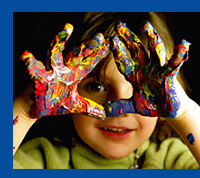 • Children have the opportunity to play with paints to create amazing designs, colors and textures on paper. Plus, we’ll do face painting and clean up the mess. • The artwork is left to dry at the person's/ child’s residence. • The designs are collected several days later and are collaged together to create an amazing piece of artwork — takes roughly 2-3 weeks to complete. • At near completion, a photo of the design is emailed to you for final approval. • Upon approval, the child’s signature is incorporated into the piece along with ours. • The finished work is presented to its co-creator and new owner(s). • Pure PAINT. Go beyond the brush and paint with hands, feet, paper plates, etc. Remember to wear arty, not party clothes. • Be an ARTIST. You be the artist and create one piece of artwork of your choice – paint an object (for example a garden pot), make a drawing or create a finger painting. Themes can be chosen and the materials will vary with the age of the children. • Create a MASTERPIECE. Let’s collaborate and produce an amazing, one-of-a-kind work of art together. • UNIQUE Projects & Requests. If you would like something special for your event that you don’t see here, let us know. Hey, we’re artists, we can create anything! Additional charges/minimums apply. For Example: We had a client who collected her daughter’s paintings over several years and instead of discarding them she contacted us and asked us to condense the work down to one artistic piece. We evaluated the work and shortly after, the client received a memorable keepsake. • INQUIRE about an adult interactive art workshop — corporate events, celebrations, etc.